Help celebrate API Equality-LA's 13th Anniversary! 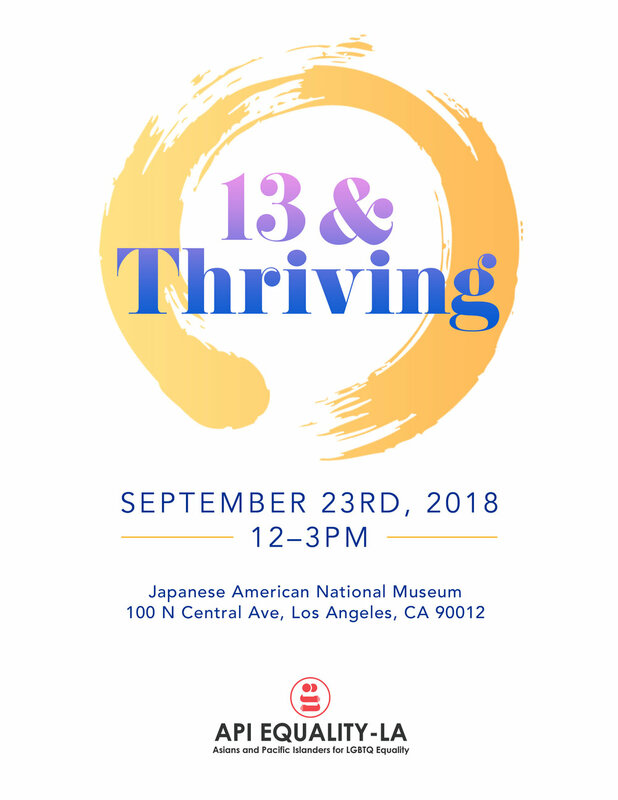 Our theme this year, "13 & Thriving", is a testament to the power of our API LGBTQ community and allies. Join us to celebrate our community’s leaders, reflect on the past year of investing in community healing, and commit to creating space for all API LGBTQ people to thrive. We are excited to honor longtime partners Lambda Legal, the oldest and largest national legal organization that advocates for the civil rights of all LGBTQ people, and Eileen Ma, veteran organizer for workers rights, immigrants rights, and LGBTQ rights, and API Equality-LA's former Executive Director. Sponsorships and ads can be purchased via the form below. For those that cannot attend, you can make a donation via the form below. For individual ticket sales, please purchase from Eventbrite. The work of Lambda Legal is vital. Lambda Legal makes the case for equality in the nation’s courts and in the court of public opinion in support of LGBTQ communities and people living with HIV. The results have lasting impact in people's lives, public policies, and ideas. Lambda Legal has been instrumental in helping API Equality-LA become the organization it is today. From educating our members and leaders about legislative battles and victories, to training our volunteers to speak to media, to helping the organization draft amicus briefs, Lambda Legal’s support has been critical to API Equality-LA and to the API LGBTQ community. As a public interest attorney and organizer, Eileen has developed projects and campaigns around the country, including efforts to address the rights of workers, tenants, immigrants and the LGBTQ community, as well as fighting for health care access and equitable development. Eileen’s leadership as Executive Director at API Equality-LA uplifted people of all ages and experiences to fight for marriage equality, education, healthcare, and immigration reform. Her ability to inspire people into action also involved organizing communities of queer API women, queer women of color, immigrants, and workers to mobilize an intersectional social justice movement. Our QTAPI Community can thrive when we work together. Thank you to all of our sponsors for helping us celebrate our 13 & Thriving Anniversary Celebration! This page is sponsorship and ad purchases only. For individual ticket sales, please purchase from Eventbrite.